Knives are presented in reverse chronological order, so you can see how my style and abilities have developed. An experimental fruit knife I designed. Having used various knives over the years to peel and cut up fruit I found I was always holding the knife backwards to how the handle was designed, so the edge was facing my thumb. So I designed this so the blade is reversed to the handle. Works pretty well. Full tang with spalted maple handle and brass pins. The blade is ground from 3/32” 15N20 steel. BL = 4”, TL = 8”. My take on a bolo; westernized handle shape combined with a blade design from the Philippines. My current favorite large bush knife. After I heat treated this, I slapped a temporary handle on it and carried it on the job for two years, using it regularly. Extremely functional design combined with lightweight materials made it a dream to use and carry. The thin blade stock makes it a very efficient cutter. I have been calling this the Beaver model. Full tang wit h recycled rubber horse-stall-mat handle and brass pins. The blade is 3/32” thick 15N20. BL = 12”, TL = 17.5”. The upper photo shows one side before a patina was applied to the blade. The lower photos shows the other side of the blade after the mottled patina was applied. This is a small full tang wharncliffe style knife. 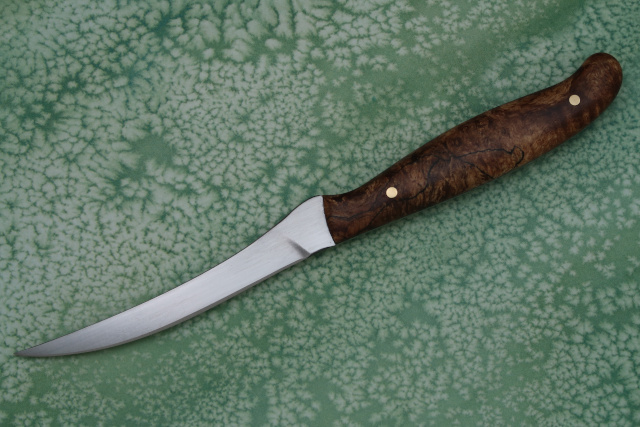 This one features a visible simple hamon on the blade and a random mottled patina on the integral one piece handle. 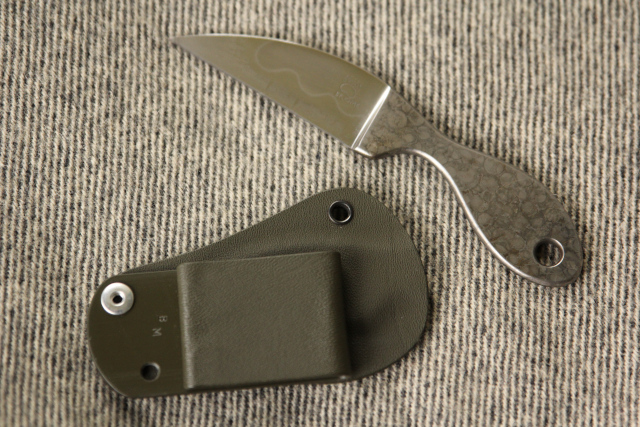 The idea here was a very functional profile in a size and shape that makes it almost a “pocket fixed blade”. The handle shape just fits the palm of the hand perfectly. Nothing extra to get in the way. I carry one of these almost daily. Very handy size, blade shape is very practical for most chores, and the sheath allows for a variety of carry options. I have been referring to this as the Wren model, at this time. This one is 5/32″ 1095. BL = 3″, TL = 6 7/16″. 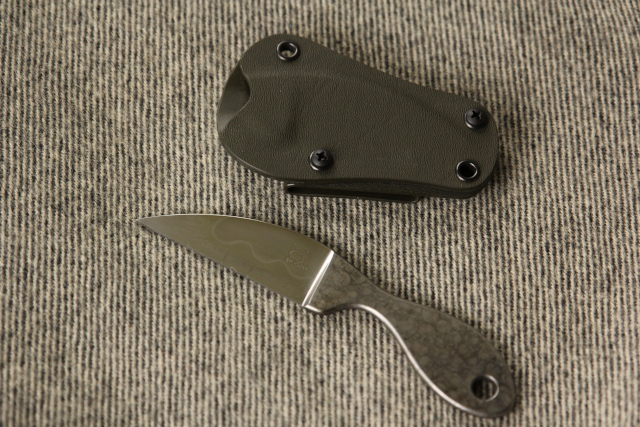 It comes with a low profile Kydex sheath and separate clip, allowing adjustment for various wearing configurations (inside or outside the waistband, vertical right rear, upside down, diagonal front left, neck carry, etc.). A medium sized drop point with a blind tang and mortised Poplar handle and brass pin. 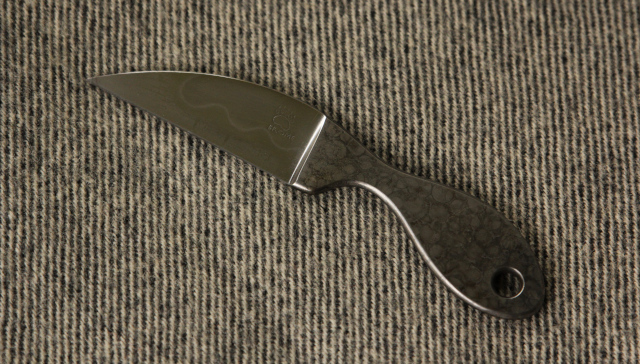 The blade is convex ground from 3/16” stock O-1 and differentially heat-treated. BL= 7”, TL =11.5”. This knife has a longer ricasso for choking up on the blade. The blade has some patina from testing and use. A medium but very sturdy through tang drop point for an elk hunter. Flat ground to 3/8″ from the 3/16″ thick spine. 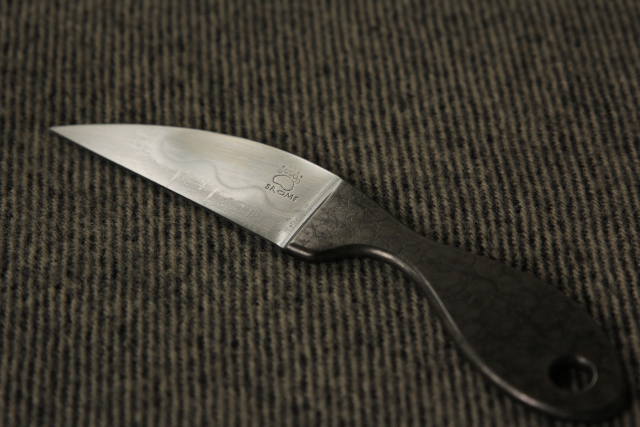 The blade is differentially heat treated O-1. Brass guard and birds-head pommel, black spacers and European stag handle. BL= 4.5″, TL=9″. This was a custom order. 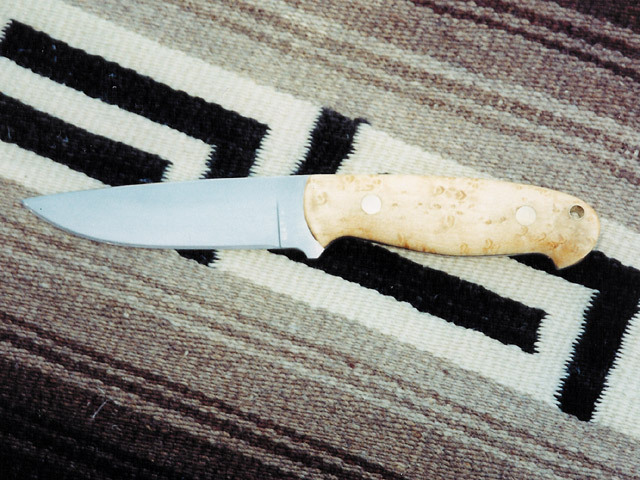 A large blind tang drop point. Convex ground blade from 3/16″ stock, differentially heat treated O-1. Brass guard, brass and black spacers with English walnut handle and mosaic pin. BL=6″, TL=10 7/8″. This one has a longer ricasso for choking upon the blade. 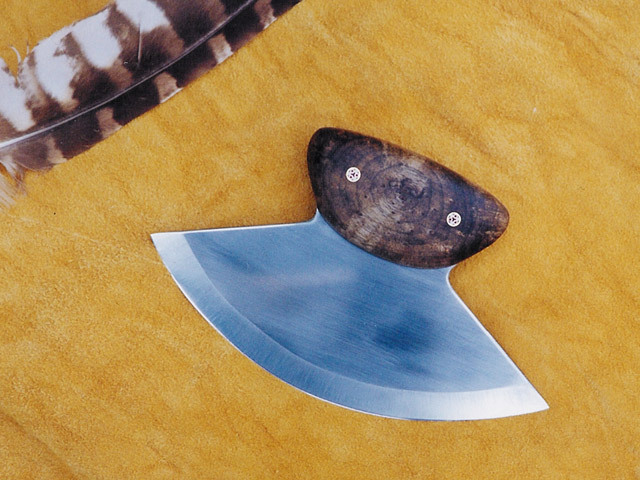 A medium sized full tang ulu. Flat ground blade from 3/32″ stock, differentially heat treated bandsaw blade from a lumber mill (possible L-6). The handle slabs are Myrtle wood (bay laurel) with mosaic pins (as well as a hidden epoxy pin for security. BL (tip to tip)=6″, TL (handle to edge)=3 5/8″. 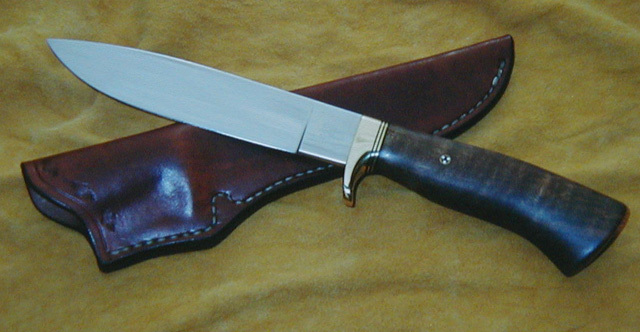 A full tang utility pattern with an integral guard. Convex ground from 3/32″ stock, differentially heat treated O-1. Black spacer material, birds-eye maple handle with brass Corby type rivets and a brass-lined lanyard hole. 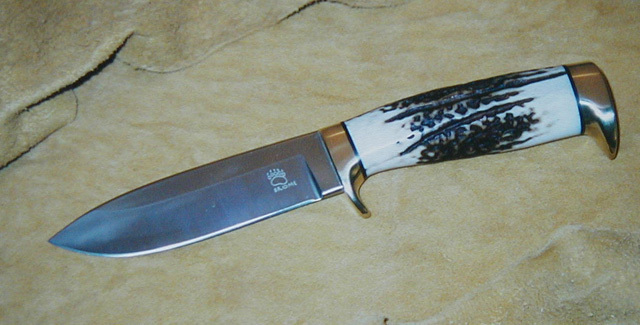 This knife was specifically built for a right handed person and has an asymetical handle (looking down form above) such that the palm swell on the right hand side of the knife is larger. It also was my first tapered tang. BL=41/4″, TL= 83/4″. 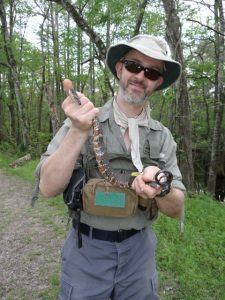 I work full-time as a wildlife biologist and have a small homestead with my family outside Albany. More about me. © 2001-2019 Stone & Steel Knifeworks. All rights reserved. Web design by Lark Labs.